You know exactly how many bags of mulch will fit in your trunk and just how to arrange those bags so you can maximize all the space. You swore you would never put bags of mulch in your back seat but now you also know how many bags of mulch will fit in your back seat. You keep your own plastic protector sheets from previous garden center visits in your trunk for any impromptu trips that result in you buying more plants. You have a trunk tidy from England to help keep all those plants upright in the trunk. You keep a trowel, some plastic bags and an extra pair of gardening gloves in your trunk so that if someone offers to let you dig up a little plant, you are all set. Bonus points if you also have an extra pair of pruners in the glove compartment, just in case. You have a bumper sticker on your car that says "I stop at all garden centers". Bonus points if you've also purchased a vanity license plate with something like ILUVPLTS on it. Or ILUVGDNG. Or FLOWERS. Or GDNGROX. 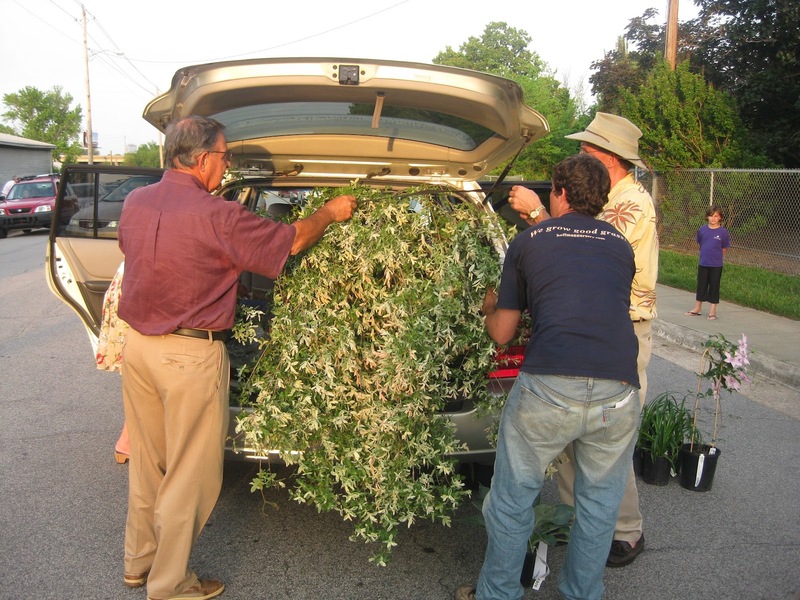 You are convinced that if you visualize the plants fitting in your car, they will fit, especially if you get some friends to help shove them in the back of your SUV. You've considered buying a convertible because you could lower the top to make it easier to haul big trees and shrubs in the back seat. Your friends automatically wipe their hands across the seat in your car before they get in so they don't end up with mulch or leaves stuck to their hind end when they get out of your car. Your car is seen so often in the parking lot of the local garden center that friends and family are beginning to wonder if you actually work there. You've purchased so many plants in one trip to the garden center that it looked like anyone who came with you would have to hold a plant or two or three in their laps for the drive home. Bonus points if you bought so much it took two trips in your car to get it all home. Subtract points if you ever left friends or family stranded, even for a short time, because you drove the plants home first. And finally, you might be a gardening geek in your car if you bought a truck for gardening because that would make it easier someday to bring home a big bottle tree and an old rusted out wheelbarrow. 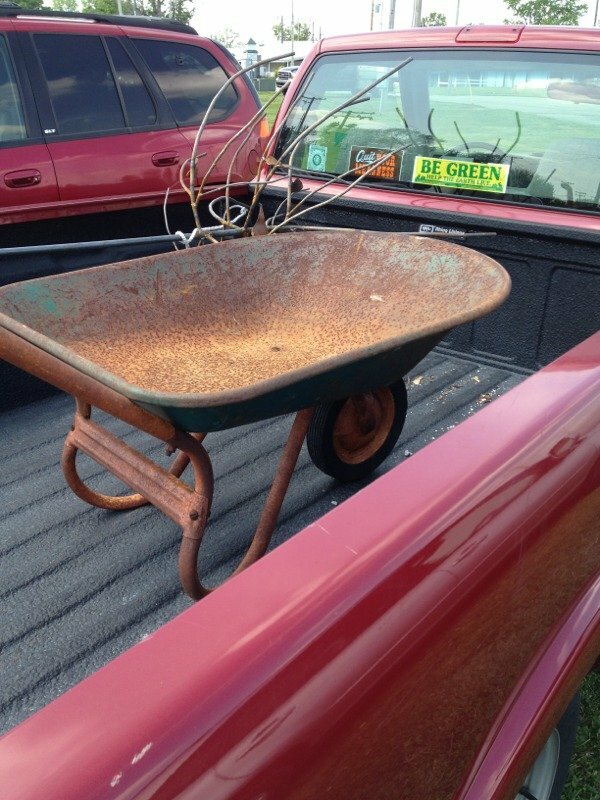 Garden geeks really do need trucks. Love the new 'find'. Love it! We went to a plant auction last weekend and I was wedged into our VERY full truck. 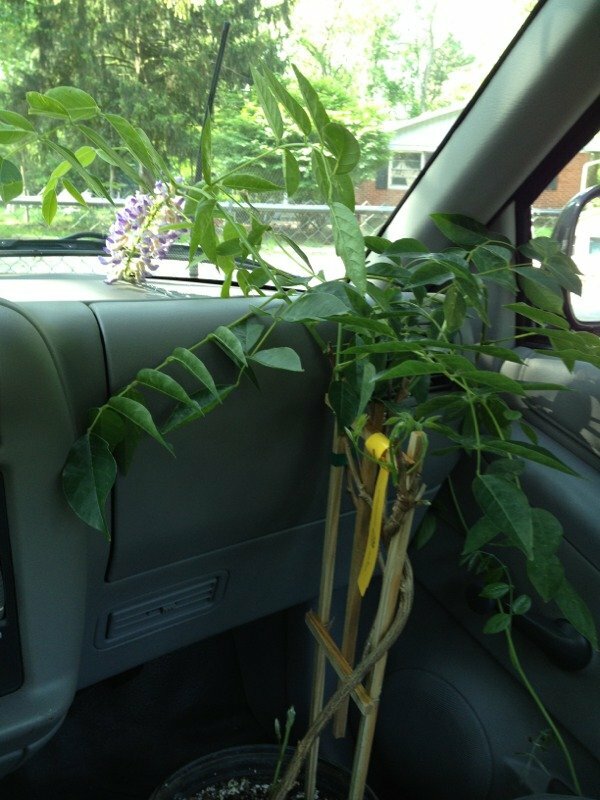 Oh yeah, you are a Gardening Geek and yes, my friends know to wipe off the seat tactfully as they get in my car. Ha! I've been looking for a truck, but not one so nice I'm afraid to fill it with composted manure. Well, I didn't actually add it up, but I plead guilty on MANY counts! My previous car was dubbed "The Compost Heap" by my husband. Now I have a truck that he finds "disgusting" because it is constantly filled with something related to gardening ... plants, soil, mulch, tools...whatever. If it's related to gardening, it's in my truck. I rarely have room for passengers of the human kind. 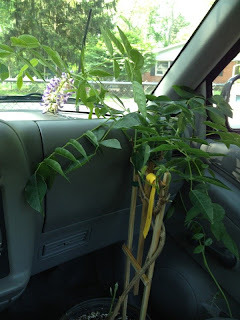 Sometimes when I drive home, I have plant parts tickling my face because my truck is so crammed full of plants there is barely room for me :-) That's a great day! Don't forget to get a car that the back seat folds down. Then you can put 10' steel edging in the trunk, through the folded down back seat and laying on the console between the bucket seats. Yazzer. or a 8' weeping alaskan cedar the same way. I've been told if there is enough soil in your car (trunk, floor, seats...anywhere!) to plant in THEN you are a real gardener, if so I qualify. I do have those plastic sheets you mention, and cardboard flats for keeping things stable. I really need to keep a trowel and gloves handy too...great idea. Oh and I love the crowd that gathers round to watch and see if I really will be able to fit that large (fill in the blank) in my car. Where there is a will there is always a way. Ha! I definitely qualify! I have even squeezed my kids in the car and covered them with plants (at least I didn't leave them behind :) I don't know what we would do without our truck. A must for gardeners! Ha, I'm safe...only subscribe to one of the above! Guilty - right down to the old rusty wheelbarrow! A friend was throwing it away and I got it into the back of my old van instead. It joined the garden fork; the hoe; the shears; the trowel; string; net and canes that go back and forward to the allotment with me! When it was time to replace my last car, I only looked for cars I deemed 'shrub-worthy'. If it wasn't big enough to haul mulch, compost, or large shrubs, I didn't want it. :o) I don't even bother with the plastic the nursery offers. The new soil can just blend in with whatever was already back there.